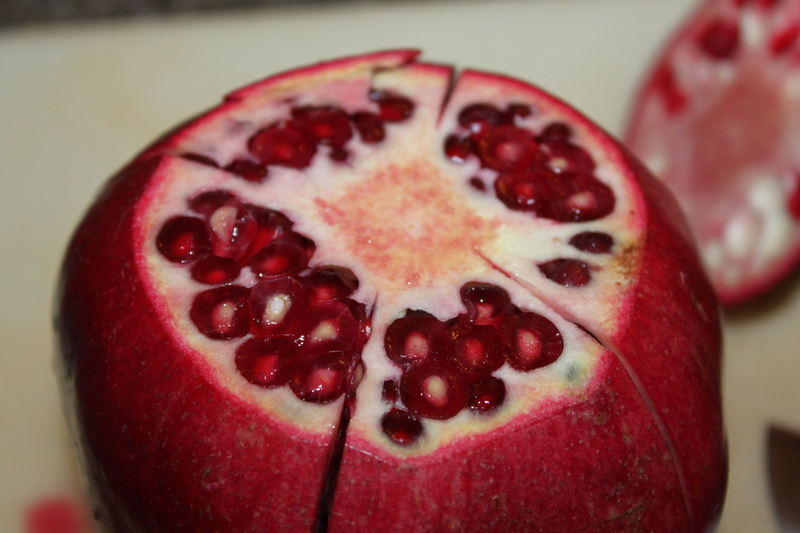 The Pomegranate – Tips, Peeling Tricks And Recipes For This Super Fruit! Pomegranates are considered a super fruit because of the many nutritional benefits that they hold. As Fall progresses, you will notice an addition to the produce aisle at your local farmer’s market or grocery store. That is because it’s Pomegranate season. I have to admit, the first few times I purchased Pomegranates – it was solely for Christmas decorations. I had no idea what to do with them and wasn’t sure that I would even like the taste. A few years back, I finally became determined not to let them intimidate me – and fell in love with the taste! And now, every year, we anxiously await the three month period when we can purchase them. Pomegranates are considered a ‘super fruit’, with a multitude of nutritional benefits. They are full of antioxidants, helping to prevent heart disease and cancer. 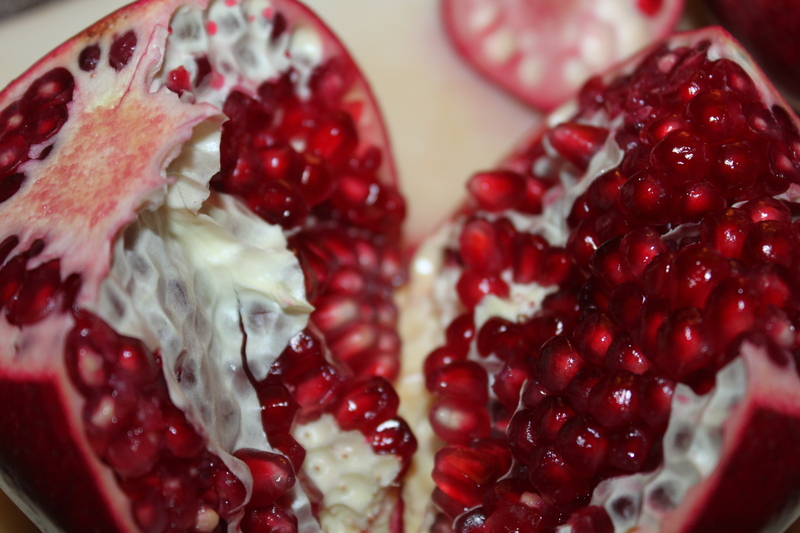 Pomegranates contain phytochemicals – that can reduce the risk of breast cancer. They also help decrease the risk of osteoporosis and provide an anti-inflammatory property that eases arthritic and other inflammatory conditions that cause pain. Oh – and they taste great too! With all the health benefits that pomegranates provide us, the next step is to find the easiest way to add these to our diet. 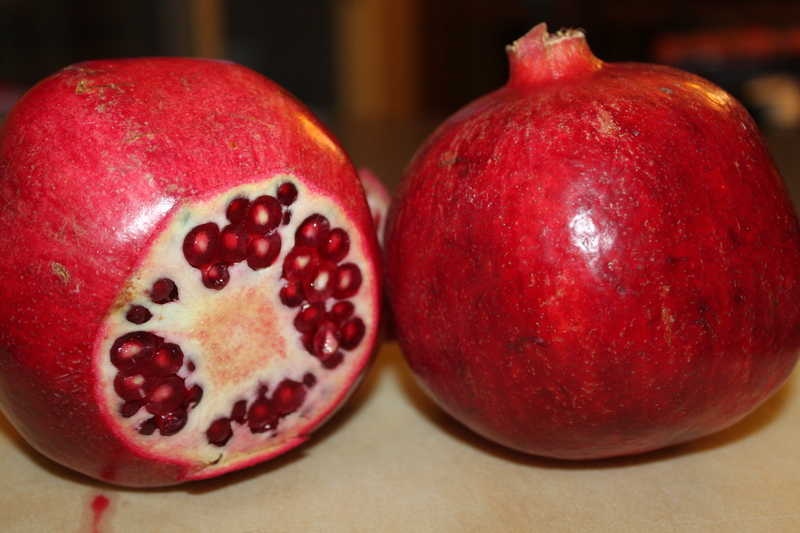 After you cut the top of the pomegranate, score each section which is easily seen. 1. Cut off the top ‘stem’ portion of the fruit to expose the arils and seeds. The arils are pouches of liquid and the seed is the tougher part at the top of the pouch – all which are eaten. 2. 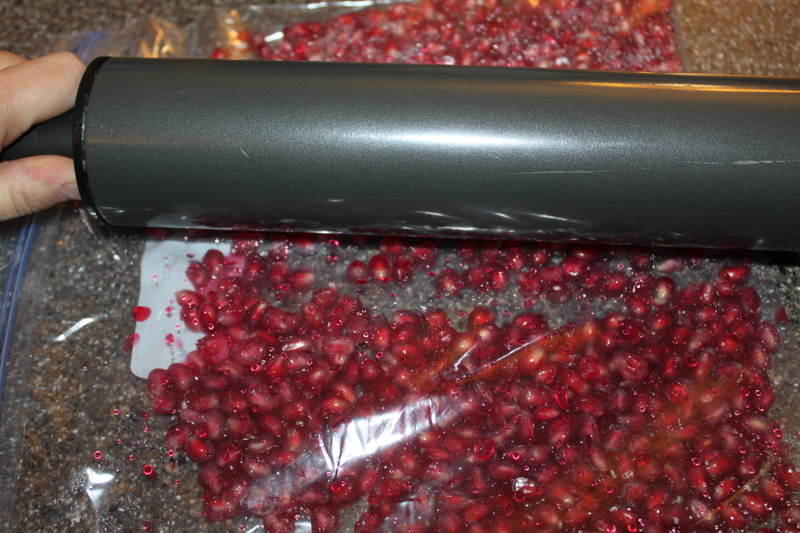 Score the sides of the Pomegranate with a knife – I typically make 4-6 scores. You don’t want to cut through the fruit, only the thick rind. Separate each section to expose the arils and place into a bowl. 3. Option 1 -Pull apart each section to expose the arils – over a large bowl pull the rind away from the arils. Option 2 – Pull apart each section. Hold one section in the palm of your hand with the skin side up and pound a wooden spoon on top and the arils will fall out. **Great option if you need some stress relief. After 10 minutes, you can easily loosen the arils from the rind. Option 3 – My preferred method: Pull apart each section and place in a large bowl. 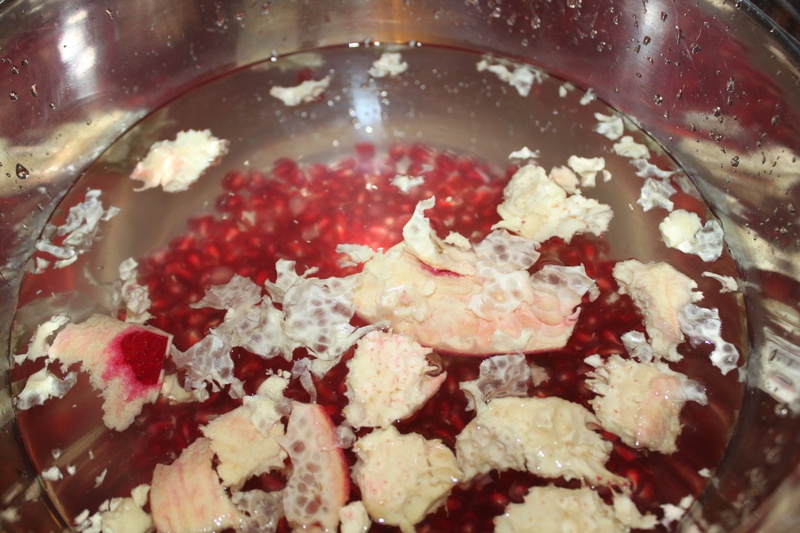 Fill the bowl with water covering the pomegranate. Wait 10 minutes and watch as the arils sink to the bottom of the bowl and the rind begins to float. Skim off floating rind and strain arils in a colander. 4. Store in an air tight container after you have finished snacking. There are endless possibilities on how to eat a Pomegranate. Here are a few basic ideas to get you started and please let us know how else you enjoy this delicious and fun fruit! Don’t worry if you don’t have a juicer – a rolling pin works just fine. 1. Juice – You are only a few minutes away from drinking all natural and fresh Pomegranate juice. Add the arils to a plastic bag, remove the air and seal. Use a rolling pin to gently crush the arils to release the juice into the bag. Once you have the juice, snip the edge of the bag and release it into a glass. Cut the corner of your plastic bag and strain your juice. It’s that easy! 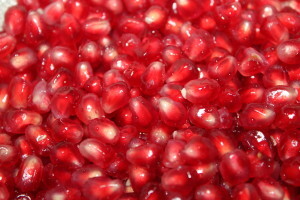 A medium Pomegranate should produce about 1/2-3/4 cup of juice. Drink it plain or add to your favorite recipe (see banana strawberry smoothie recipe). 2. Add it to your morning oatmeal. 3. Add it as a topping to your favorite dessert – ice cream, yogurt, etc. 4. Add it to your salad. However you choose to use your Pomegranate – Enjoy! 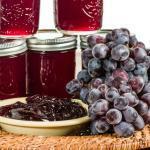 An easy to make grape jelly recipe using half of the sugar of standard grape jelly recipes. In a large bowl, add enough grapes to fill the bottom of the bowl. Using a potato masher, crush the grapes. Add the crushed grapes to a large non-reactive stockpot. Repeat until all the grapes are in the pot. Add enough water to the pot just until the grapes are barely covered. Bring the grapes to a boil over medium-high heat, stirring frequently. Reduce heat and simmer for 10 minutes. 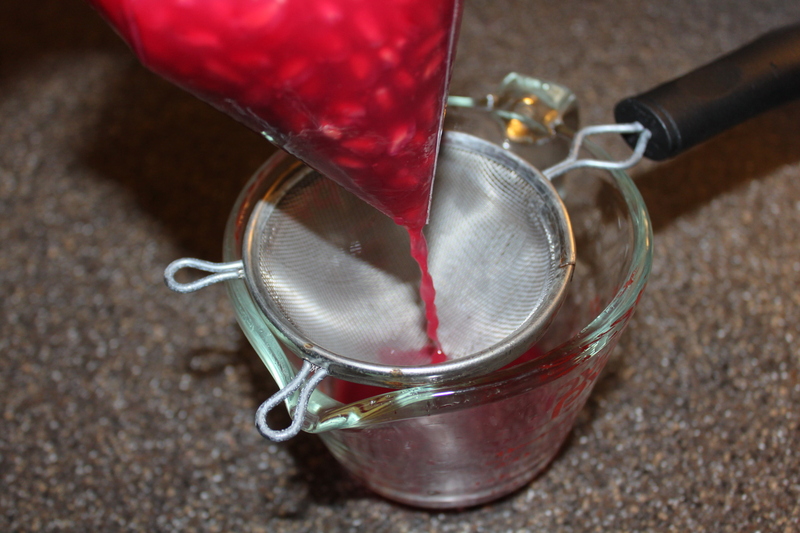 Pour the mixture into a jelly strainer or in a colander lined with cheesecloth over a large bowl. For best results let the mixture strain overnight. In a small bowl, add the pectin and ½ cup of sugar and mix together. Set aside. Place a metal spoon in a glass of ice water and set aside. Pour the strained grape juice into a large stockpot and add the pectin/sugar mixture. Over medium-high heat cook the juice until it begins to boil. Stir in the remaining sugar and bring it back to a rolling boil. Let it continue to boil for 1 minute and test the thickness using the cold spoon. Fill the teaspoon half full and set it on a plate. Once It cools to room temperature, turn the spoon sideways. If the gel has thickened to the desired consistency you can begin to fill the sterilized mason jars, leaving ¼ inch head space. If not, continue the boiling process and retest until it thickens. You can freeze the jelly in freezer-safe mason jars or process in a hot water bath for 5 minutes (adjusting for altitude as needed) for both half-pint and pint jars. oldworldgardenfarms November 8, 2013 September 2, 2018 Recipes, Sauces Dressing Jams Misc. ← Making Vintage Signs From Pallets or Barn Wood On The Cheap!